A recent finding in a Connecticut hospital involving intravenous drugs contaminated with mold have raised legitimate concern about the detriments of mold growth in US hospitals. SI Restoration, an authoritative source for safe and efficient mold remediation, has published a call to action for citizens, doctors, patients, and hospital officials to be wary of toxic fungal growth in medical institutions. 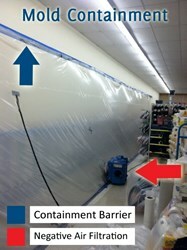 SI Restoration stersses urgency of mitigating mold found in hospitals. Mold specialists urge patients, doctors, families, or anyone frequenting US hospitals to be vigilant of the toxic fungal growth. According to an nbcnews.com report published in March of 2013 titled Nurse Spotted Mold-tainted Drugs Right Away, Hospital Says, a nurse at Connecticut’s Yale-New Haven Hospital discovered mold floating in five containers of intravenous drugs during a routine check of the hospital’s inventory. Though the five bags of diluted magnesium sulfate were contained and confiscated, it is reported that the source who sent shipment containing the tainted drugs also sent order to other hospitals in Connecticut, New Jersey, Pennsylvania, and Delaware. SI Restoration, a leading expert in mold remediation since 1989, has multiple locations throughout the areas possibly affected by the mold-tainted drugs. Once it was discovered by mold remediation technicians that the contamination had occurred, SI Restoration released a call to action in October 2013 (entitled How to Prevent Mold Outbreaks in Hospitals) for anyone relying on the safe and secure nature of our nation’s hospitals. Having the mold-tainted magnesium sulfate mixture injected into a patient could have resulted in a life-threatening infection. However, mold remediation experts point out that the tainted drug could have caused a problem far worse. Mold spreads and thrives in any moist, dark, and humid environment. As an institution that demands sterility and sanitation, hospitals are where people go to heal from infections not to contract them. Mold symptoms can occur in those allergic and non-allergic alike. Symptoms and reactions include skin and eye irritation, respiratory infections and complications, sinus and nasal congestion, high fever, and other infections. These symptoms paired with pre-existing conditions of those admitted in a hospital can prove to be deadly. Mold specialists urge patients, doctors, families, or anyone frequenting US hospitals to be vigilant of the toxic fungal growth. Though proper mold remediation could cause a temporary rift in the everyday workings of a hospital, the negative long-term effects of mold exposure to patients and medical practitioners could be catastrophic. Safe and efficient commercial mold remediation must be carried out by a certified contractor who is equipped to handle containment, eradication, and removal of toxic mold spores. Certified mold contactors must also carry proper insurance and bonds to protect all parties involved in the remediation process. Remediation of the mold should be carried out under stringent guidelines like those outlined in the IICRC S520 Guidelines for Mold Removal.